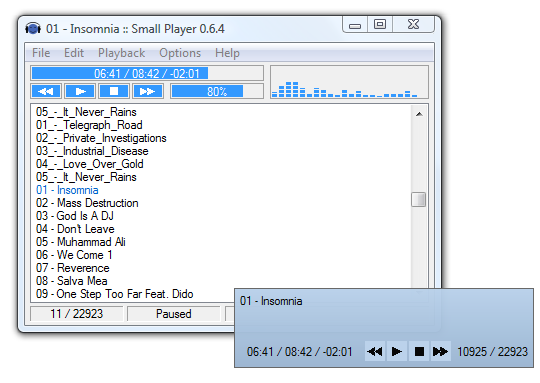 Small Player is lightweight and simple audio player, free for use, written in assembler and only for 64bit (x64) versions of Windows. I first started making this player in year 2005., that's the time I first realized that Winamp is big&slow bloatware (:P). So as you can imagine Small Player is complete opposite of Winamp, small, fast and low on functionality :). It has only the features that I really need and use because I didn't really plan to release it publicly. It was made to suit my needs, but if you want a basic and simple audio player give it a try. NOTE: I don't intend to release 32bit version. By proceeding to download or install Small Player, you are deemed to agree to be bound by the terms of this License.